Notes and Volts: What the Heck: is Balanced Audio? What the Heck: is Balanced Audio? Audio comes in two flavors, Balanced and Unbalanced. Even the names give a hint as to which is the more stable system. Would you prefer to hang out with your balanced friend and share a few laughs at the local pub, or the unbalanced one who calls weeping at 3am needing your help to dump a body? First, lets talk about unbalanced audio. You deal with unbalanced audio all the time. Whenever you connect a DVD player through the RCA jacks on your TV, hook some speakers to your computer sound card, or plug some headphones into your iPod you are using an unbalanced signal. An Unbalanced audio signal requires two wires. The inner wire carries the signal. The outer wire surrounds the inner and acts as a ground/return. What is the problem with this setup? Unbalanced audio is like a terry cloth bath robe. Excellent for lounging around the house, but terrible for crossing the Arctic circle. Like your robe, Unbalanced cables are terrible for covering distance and dealing with harsh environments. Back in the days of Phonographs when your stereo system was all self contained in a nice wooden cabinet, this was somewhat acceptable because the cables could all be kept short and managed. But we now live in an age where our audio gear consists of many separate boxes with cables crisscrossing behind our IKEA entertainment centers like electrified spaghetti. A long run of unbalanced cable basically behaves like an antenna, happily picking up nearby electro-magnetic fields and adding them to your audio signal. This causes the various hums and buzzes that drive you crazy. This is where balanced audio comes to the rescue! A Balanced Audio cable contains three wires. The two inner wires of the cable are twisted together and carry two versions of the audio signal. One wire carries a positive (Hot) version of the audio signal. The second carries a inverted or negative copy of the same signal (Cold). These two wires are wrapped in a metal braided shield that is attached to ground. "So what?" you might ask. Well, the fact that there are two copies of the signal with opposite polarities gives balanced audio systems their noise immunity. The following video demonstrates this principle. The first part of the video shows how two signals of opposite polarity will cancel each other out when mixed together. It's just simple math. 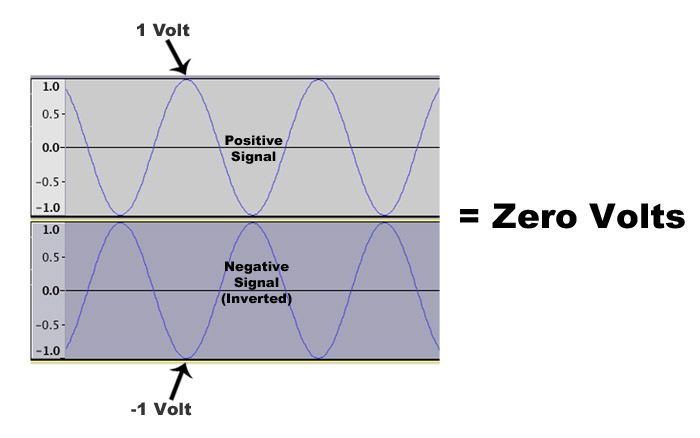 When a 1 Volt signal is added to a -1 Volt signal, the result is Zero Volts. 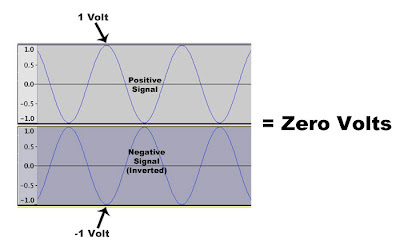 Watch as the volume of the negative signal is raised, the volume of the output signal is decreased. 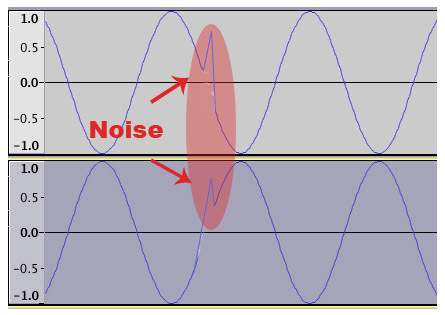 The second part of the video demonstrates what happens when Noise is added to the original signal. The noise and the signal add together to become..You guessed it, a Noisy Signal. Now here's where the magic happens! When the two signals reach a Balanced Input on a piece of equipment, they are passed through a device called a Differential Amplifier. This is a fancy term for something that only amplifies the difference between two signals and rejects parts that are similar. 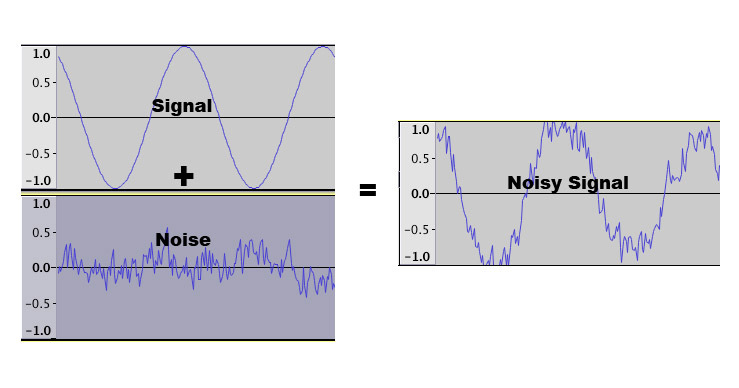 It works something like this: When the two signals reach the differential amplifier, the negative version of the signal is flipped. It is now the same as its positive counterpart. Now, here is the tricky part. 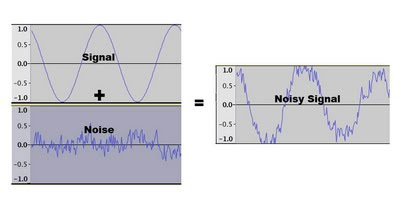 If any noise got added to the signal along the way, it was added to both positive and negative parts of the signal the same way. 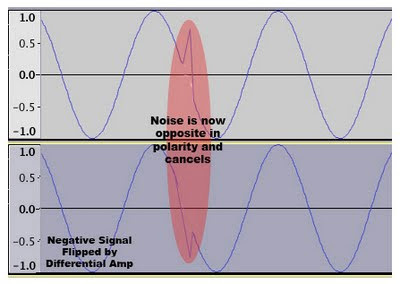 When the negative part of the signal is flipped by the Differential Amp, the noise is now opposite in polarity and cancels itself out while the good signal is the same polarity and passes through. You can see in the last part of the video how the noise gradually disappears as the flipped negative signal is added to the original. What you end up with is the original audio signal intact with the noise removed. And that was the point all along! American Audio Visual technology allows one to syndicate inputs such as video or slides with sounds to transmit or convey information effectively.